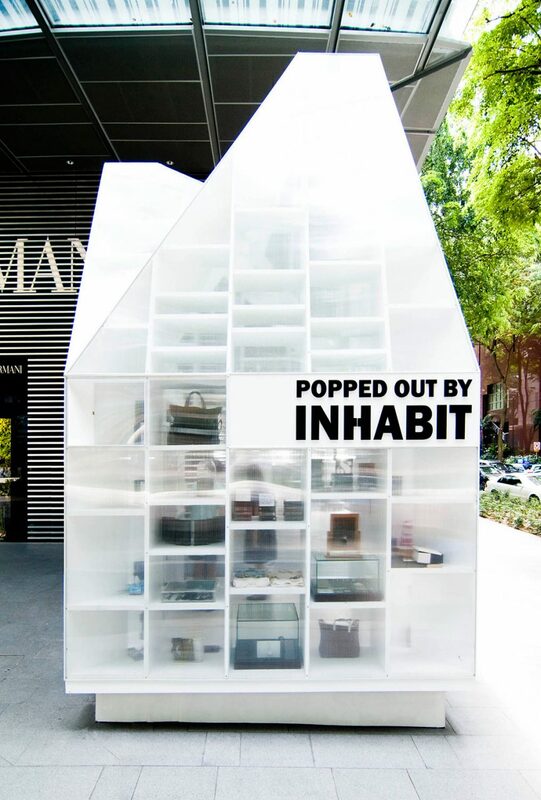 Instant Pop Up (Popped Out by Inhabit) was a temporary 215-square-foot (20-square-meter) piece of architecture designed and built and then removed between November 2010 and March 2011. 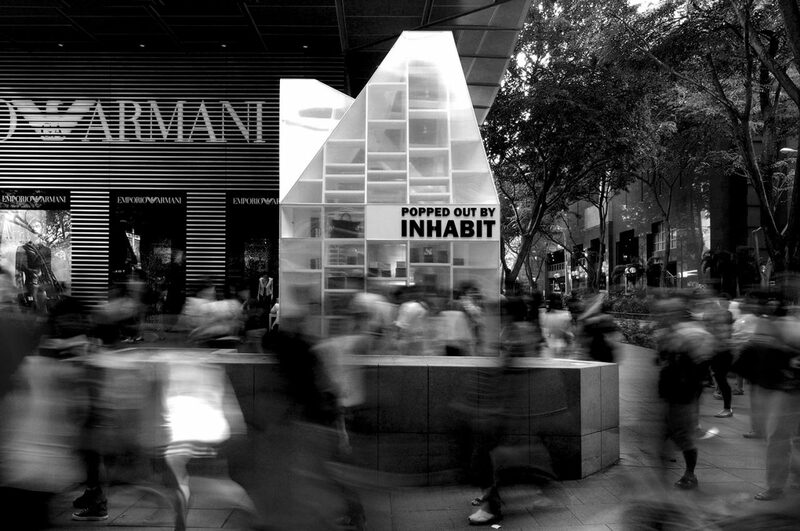 It was located prominently on Singapore’s main shopping street, Orchard Road. Two pyramidal volumes intersected about and shared the same plan configuration. The overall volume oscillated between elemental and complex, simple and dramatic. 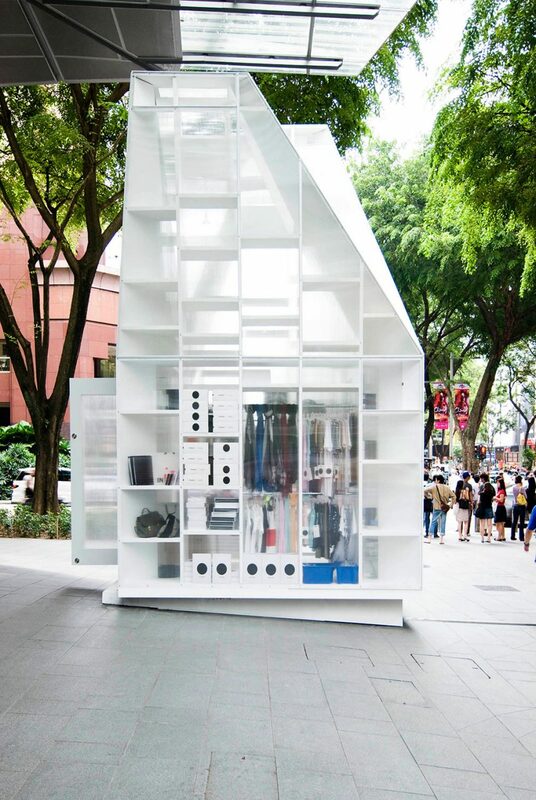 Painted plywood shelving offered the necessary display spaces, holding clothes, shoes, accessories, and perfumes at the lower levels. 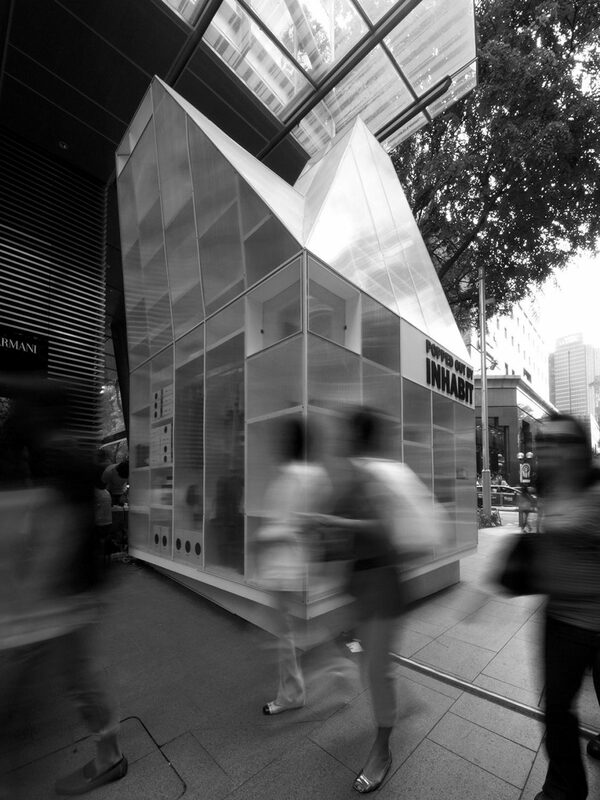 Above, the plywood formed the trapezoidal structure of the dynamic roof forms. Openings were strategically located to allow for cross ventilation, stack-effect cooling, security, and the evacuation of heat. Shelving was angled and open to the exterior for positive ventilation at the top of the roof forms, as well as at three corner locations at the lower levels. Two large doors were positioned centrally along the southern elevation, facing outwards to capture and direct prevailing microclimate breezes. 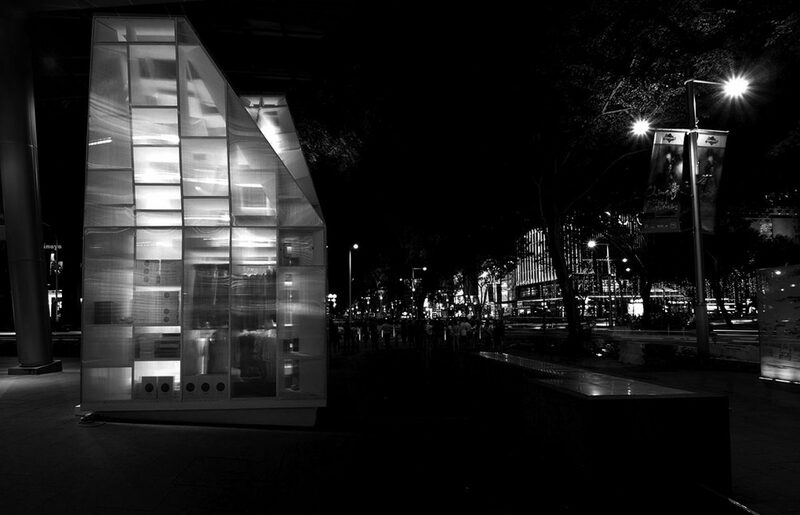 The exterior, clad in inexpensive polycarbonate, provided rain protection and security, doubling as a light-diffusing and light-absorbing veil. During the day, the architecture read as a thickened white volume. In the evening, it transformed into an illuminating lantern. The veil was found here in two incarnations: one thick and one thin. The thick veil encompassed the vertical and horizontal shelving components that structured the space. 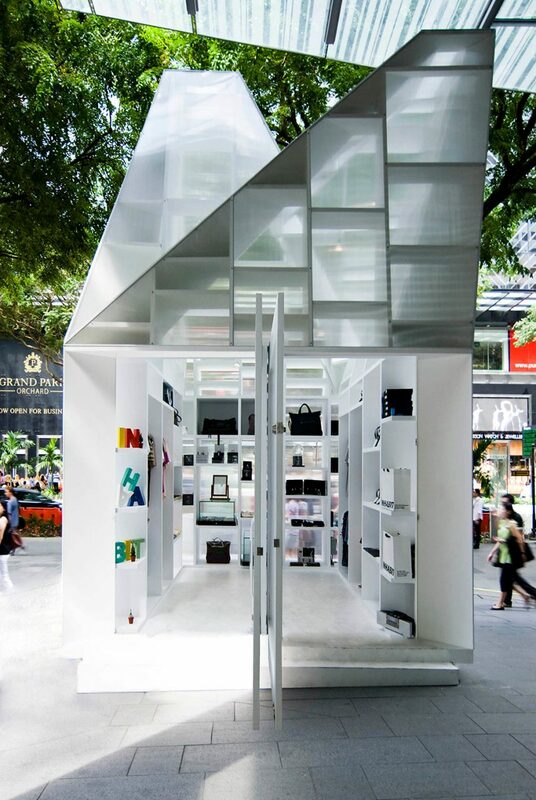 This trellis-like scaffolding not only contained the program (the display and selling of merchandise) but was also calibrated to the climate. 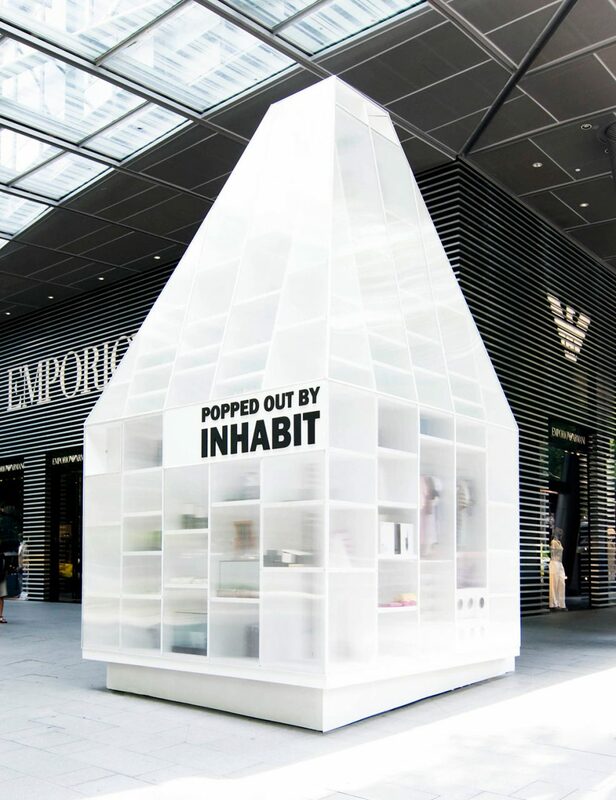 The thin veil of polycarbonate refracted and diffused the light, interfering with the view of the merchandise through translucency, while at the same time producing an attraction via its illuminating optical quality.